Chop the pineapple into small pieces and keep aside. Add water in a oven safe bowl and dissolve 1 cup sugar in it.Reserve 2 tsp sugar for later use and keep it in oven for 2 minutes.Stir between at every 30 minutes. Take another oven safe bowl,add 4 tsp ghee and semolina,mix well. Keep it in oven for 1 minute,stir in every 30 seconds.Take care that it should not burn at the bottom. In a oven safe bowl add the chopped pineapple chunks, pineapple essence and reserved sugar.Pineapple essence will give nice flavour and colour,so if you want to add go ahead ,otherwise skip it. Don’t add water,just keep it in oven for 1 min / till the pineapple become soft .Stir in between at every 30 seconds. Add boiled pineapple,roasted semolina with sugar water and mix well.Add the reserved 1 tsp ghee and mix well. Keep it in oven for 2 mins,stir in between at every 30 seconds.Add the roasted cashew nuts finally and serve hot. Here is the yummy Pineapple Kesari is ready to serve. 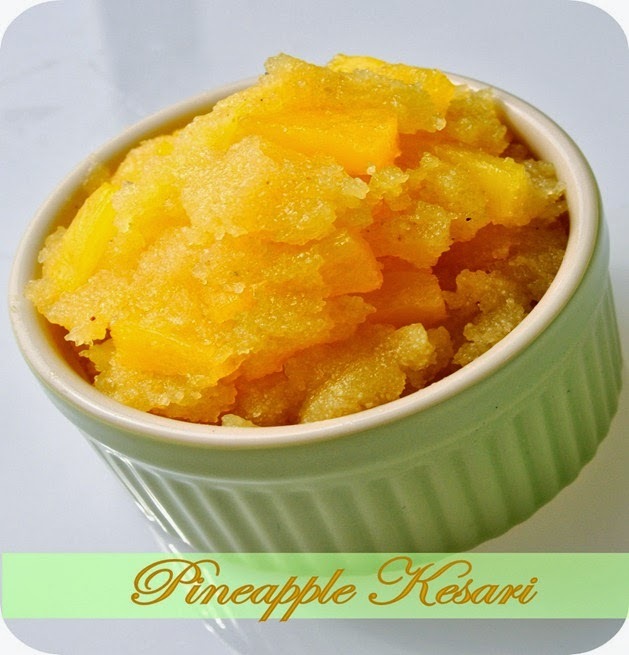 Nice guest post.. pineapple kesari and microwaved version.. Winner all around. Lovely post, kudos to both of you ladies. Nice microwave dish. Its really yummy. 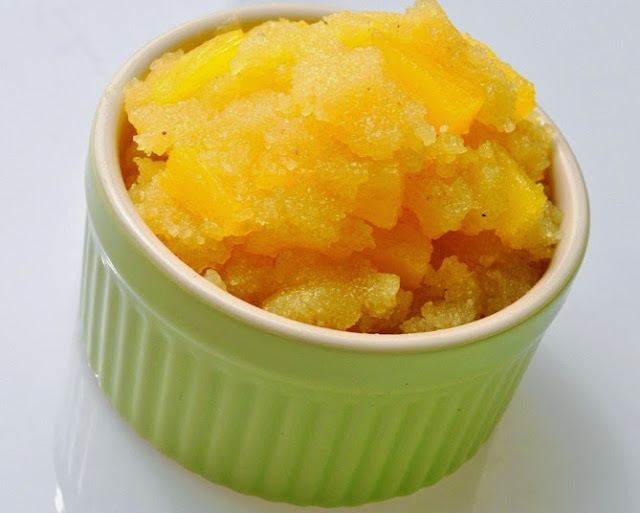 Love this kind of fruit based kesaris, inviting and beautiful looking kesari..